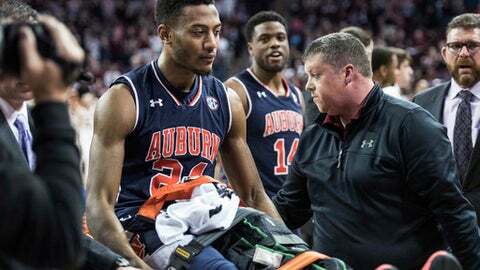 MONTGOMERY, Ala. (AP) Coach Bruce Pearl doesn’t believe losing another post player will be a breaking point for an Auburn team on track for a rare Southeastern Conference men’s basketball title and NCAA Tournament berth. Now, the already-undersized Tigers will try to close out the regular season and capture their first SEC title since 1999 and third overall without their top eligible big man. They’re virtual locks for their first tournament berth since 2003. But one that must again figure out how to contend with even more significant size disadvantages. Auburn (23-4, 11-3) has held out center Austin Wiley and forward Danjel Purifoy all season, leaving the Tigers as one of the smallest teams in major college basketball. McLemore was hurt in Saturday’s loss to South Carolina. Pearl said the operation on Sunday ”went extremely well” and that doctors think recovery will take about four months. The 6-foot-7 McLemore was averaging 7.4 points and 5.3 rebounds while leading the league in blocked shots with 73. His ability to shoot 3-pointers also created some matchup issues for opposing teams. Now, the Tigers are down to eight available scholarship players. Freshman Chuma Okeme and Horace Spencer are likely to get more minutes inside while 6-3 power forward Desean Murray could see some time at center, too. The 6-5 Mustapha Heron or 6-6 reserve Malik Dunbar could play some center, too, particularly if the Tigers have foul trouble. The 6-8 Okeke has been averaging 7.6 points and 5.1 rebounds off the bench but hasn’t started a game. Auburn has a two-game lead over Tennessee with four regular season games remaining and would win the head-to-head tiebreaker.